As you have probably figured out by now, I'm a big fan of the crockpot. It's just so EASY! And I'm continuously surprised by the epic deliciousness that comes from throwing a bunch of random ingredients into a big pot and turning it on. It's like magic. I don't know what I did before I got one a couple of years ago -- I use mine at least once a week! There's my crockpot barbaco beef and my more recent (and unexpectedly popular on pinterest!) red wine beef and onions, plus countless "basic" crockpot meals I make all the time -- shredded chicken with salsa, beef stew, barbecue chicken. Then there's my all time favorite crockpot recipe: Indian butter chicken. To die for. Well, guess what? The time has finally come for my butter chicken to move out of the way: it is no longer the BEST CROCKPOT RECIPE EVER. I know... it's a bold statement, and I had to think carefully before choosing to make it. But it's true. There's officially a NEW number one crockpot recipe in my life. 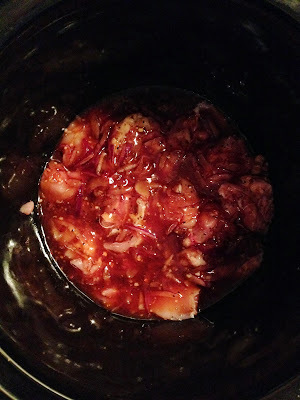 Crockpot honey sesame chicken. Holy crap this stuff is good. And it's even easier than my butter chicken! No browning the meat, no strange ingredients, it's done in half a day (perfect for weekends when the idea hits at 1pm!). 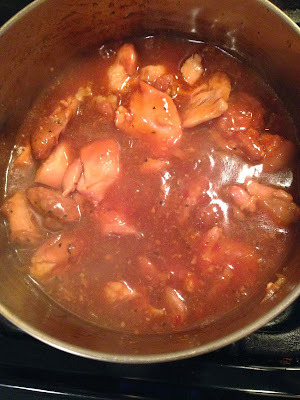 I have made several similar recipes before -- throwing some chicken in the crockpot with Asian ingredients (soy sauce, mirin, honey, and sesame oil are usually my go-to's) is nothing new to me. But this one is worlds above those. I'm not even entirely sure how it turns out so good but IT DOES. Basically... if you make one recipe from my blog... let this be it. The sauce is thick and sticky and sweet just like when you get Chinese takeout -- which is a surprisingly difficult task for me to accomplish most of the time (at least without adding tons of sugar). 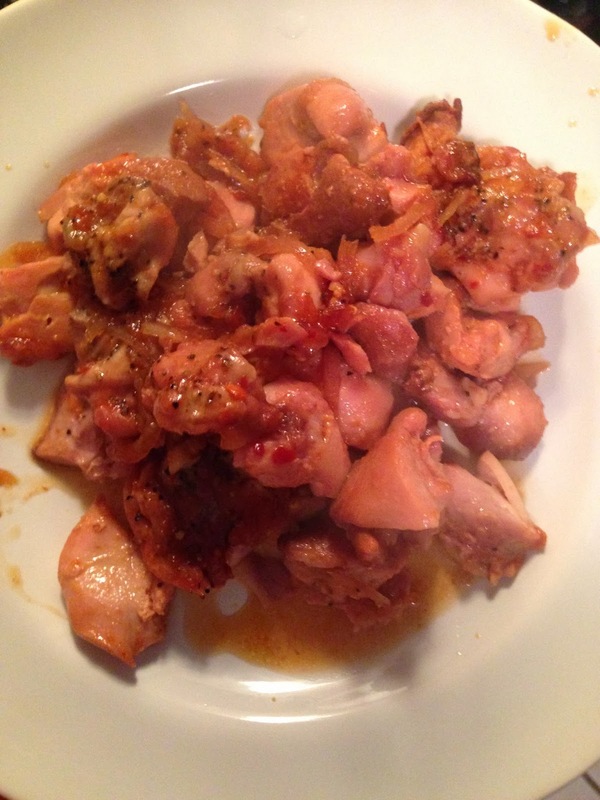 The chicken thighs are perfectly moist and tender -- much better than breasts for this, I promise! Served over brown rice and topped with sesame seeds and green onions, and best served with roasted broccoli or another veggie, it is a near perfect Asian dinner. Delicious, easy, flavorful, and healthy. You'll need about a pound and a half of boneless, skinless chicken thighs. Cut them into bite-sized pieces, removing any large pieces of fat (but no need to get obsessive about it -- some fat is good!). Toss the chicken into the crockpot and season lightly with salt and pepper. Next, mix your ingredients for the sauce: 1/4 cup low sodium soy sauce, 1/3 cup honey, 1/4 cup minced (or very finely chopped or sliced) onion, 3 tbsp ketchup, 1 tbsp toasted sesame oil, 1/2 tsp crushed red pepper, 2 cloves minced garlic, and 1.5 tsp minced or grated ginger. Pour evenly over the chicken. Cover, turn heat to low, and cook for 4-6 hours, or until chicken is fully cooked and tender. Mine was perfect after a little less than 5 hours. Don't overcook this... if you leave it in the crockpot for 8 or 9 hours, it will likely burn and be ruined! When ready to eat, remove the chicken from the crockpot using a large slotted spoon and place on a rimmed plate. Cover tightly with foil. Pour the remaining juices from the crockpot into a medium sized saucepan. In a small bowl, mix 2 tsp cornstarch into 2 tbsp cold water until combined. Pour into the saucepan with the sauce. Turn heat to high and cook until it boils. 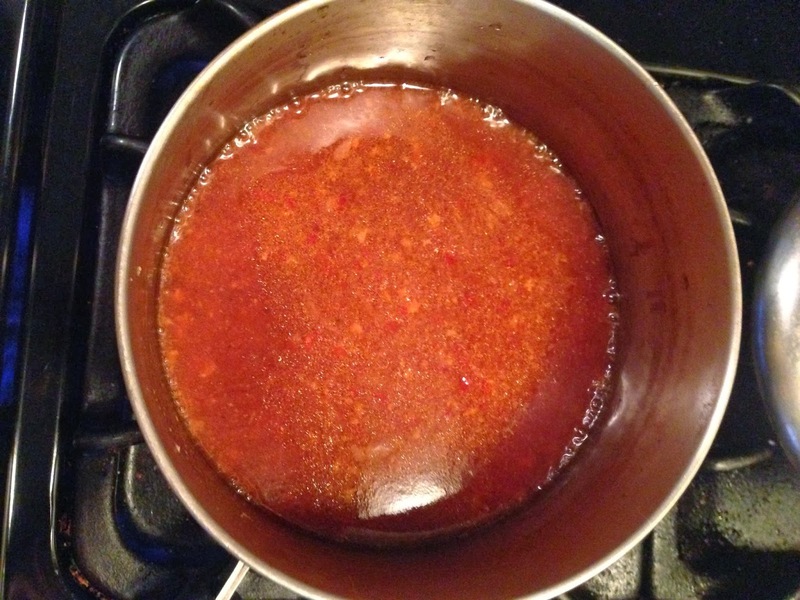 Once boiling, turn heat to medium and continue to cook until the sauce becomes thick -- about 10 minutes. Watch it so that it doesn't burn. Add the chicken into the sauce and mix gently until combined. YUMMMM. Plate your brown rice, then scoop the chicken on top, being sure to include some extra sauce. Top with sliced green onions and sesame seeds. 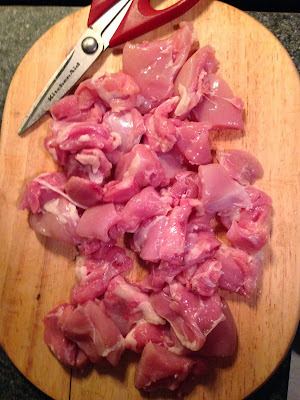 -Cut chicken thighs into bite-sized pieces, discarding any large pieces of fat. 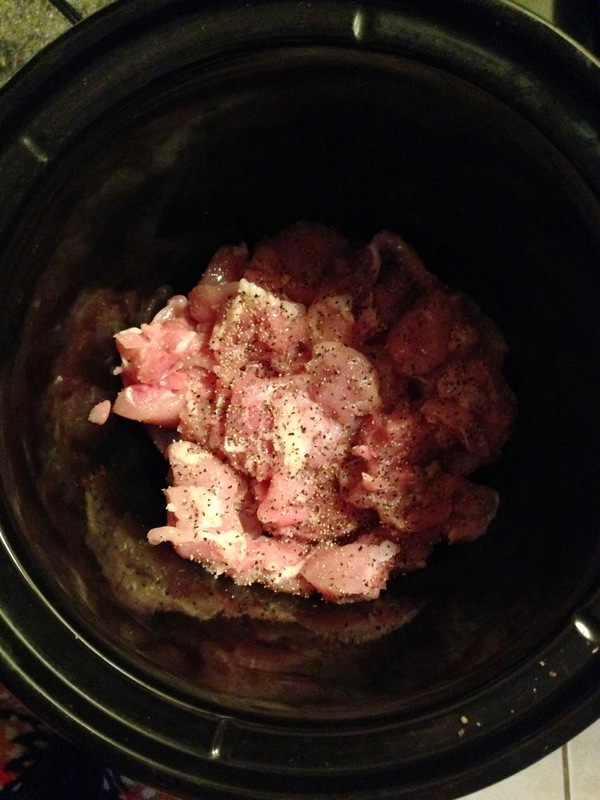 -Place chicken in the bottom of a crockpot. Season lightly with salt and pepper. 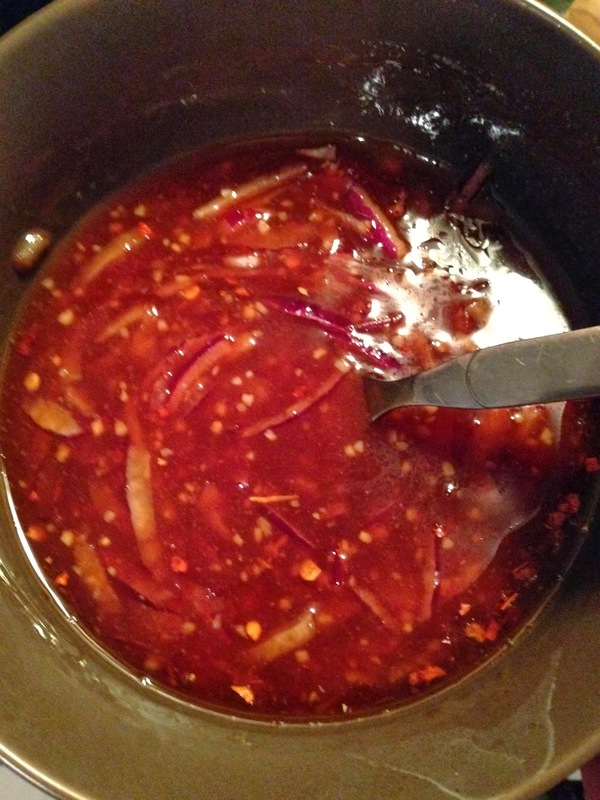 -In a small bowl, mix soy sauce, honey, onion, ketchup, sesame oil, red pepper, garlic, and ginger. Pour over top of the chicken. -Cook on low heat for 4-6 hours, or until chicken is fully cooked and tender. The sauce will burn and the recipe will not work if you leave it in the crockpot for too long. -When it's ready, remove the chicken from the crockpot using a large slotted spoon and place on a rimmed plate, leaving the juices in the crockpot. Cover the chicken tightly with foil. 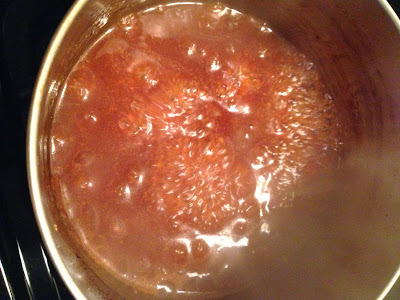 -Pour the remaining juices from the crockpot into a medium sized saucepan. 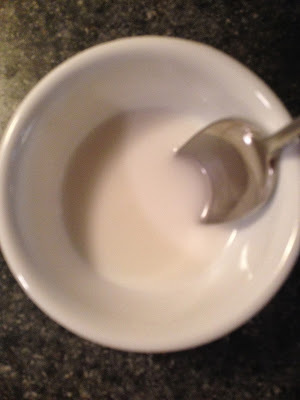 In a small bowl, mix 2 tsp cornstarch into 2 tbsp cold water until combined. Pour into the saucepan with the sauce. 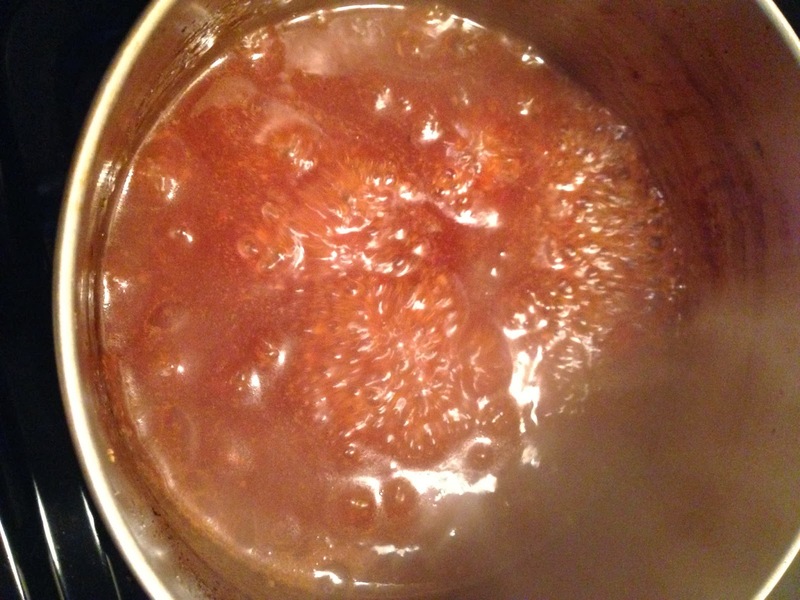 Turn heat to high and cook until it boils. Once boiling, turn heat to medium and continue to cook until the sauce becomes thick -- about 10 minutes. Watch it so that it doesn't burn. -Add the chicken into the sauce and mix gently until combined. -Serve over brown rice and top with sliced green onions and sesame seeds. This recipe is awesome Taylor! I'm in love with my crock pot too. These past few weekends I've been doing my food prep but it's felt like I'm slaving away for hours. This would be a great dish to eat through the week and I won't have to spend hours over the stove. 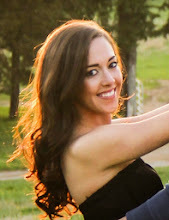 Happy Friday girl!